Be picked up at your home or hotel in Toronto, in the morning, in a casually upscale vehicle, for a whole days adventure in Niagara Falls, Niagara-on-the Lake and Niagara Wine Country. 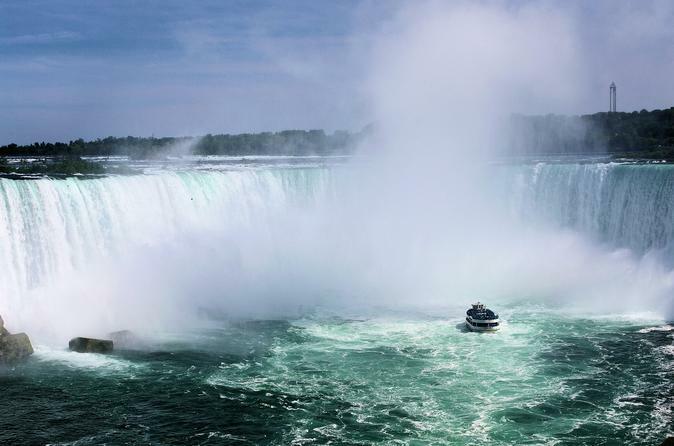 See the majesty of mighty Niagara Falls, visit and enjoy as many of Niagara's great attractions as you wish. Visit the Hill of Fun, Clifton Hill. Travel the magnificent scenic Niagara Parkway to Niagara-on-the Lake, Ontario's prettiest town, then dine and sip our finest at wineries or sample a Craft brew at one of our breweries, all of your choice. It will take approximately 8 hours or more. This is a great day, there is so much to do here. There is something for everyone. We pickup at 10:00. It takes approx. 1.5 hours to reach the Falls. Explore to your hearts content, journey behind the Falls, ride the HornBlower, walk the parkway, climb Clifton Hill, experience the SkyWheel, ascend Skylon Tower, it is all up to you. Just let us know and we will book it for you. We then load up and head up the gloriously scenic Niagara Parkway, to Niagara-on-the Lake. Here you just wander. You can shop, sip, dine or explore. We then will visit 4 local wineries or craft breweries, your choice. If you love robust reds, relish oaked whites, enjoy hearty cider or just want to sit on the patio with a great glass of sparkling, We will take you there. Niagara has some of the finest dining in Canada. Whatever you enjoy, you can find it here. Then a quick stop at the FX Chocolate Factory or Picard's Peanuts for snacks for the road and we are off, back to the city. Attraction tickets are not included in the pricing, we will however arrange for them for you for a 10% administration fee. Meals are not included, but we will make reservations for you at your request.. Wine sampling and tasting costs are not included.